They wanted to be throwing baseballs, not hand grenades, shooting .22s at rabbits, not M-1s at other men. But when the test came, when freedom had to be fought for or abandoned, they fought. They were soldiers of democracy. They were the men of D-Day. When Hitler declared war on the United States, he bet that the young men brought up in the Hitler Youth would outfight the youngsters brought up in the Boy Scouts. Now, in this magnificent retelling of the war's most climactic battle, acclaimed Eisenhower biographer and World War II historian Stephen E. Ambrose tells how wrong Hitler was. Drawing on hundreds of oral histories as well as never-before-available information from around the world, Ambrose tells the true story of how the Allies broke through Hitler's Atlantic Wall, revealing that the intricate plan for the invasion had to be abandoned before the first shot was fired. Focusing on the 24 hours of June 6, 1944, D-Day brings to life the stories of the men and women who made history -- from top Allied and Axis strategic commanders to the citizen soldiers whose heroic initiative saved the day. From high-level politics to hand-to-hand combat, from winner-take-all strategy to survival under fire, here is history more gripping than any thriller -- the epic story of democracy's victory over totalitarianism. I think the book is probably OK. The history is well done. The story is well told. The characters well defined. But this guy should have let someone else do the reading. I stopped early, because I couldn't stand it anymore. There were a couple of spots where I was genuinely afraid the poor guy wasn't going to make it he sounds so bad. Outstanding book! The listener can hear first hand the experiences of the many brave individuals who participated in this battle. Having the author read it is an added plus. Excellent book but somewhat bothered by the speech problems of the author. Not sure why the producers let Ambrose do the read. Still, very informative and well planned book, covering the invasion from A-Z. I usually avoid books when the writer is doing the narrating. Ambrose did a pretty good job although he either had a lisp or badly fitting dentures. No matter. It's a really good story compounded by the fact that it's a true story. The discs that I had skipped - every one of them - which distracted from the the tale, but I still enjoyed it. The story of D-Day told through personal stories of people involved. If you don''t like history, you won't like this. An awe inspiring book. Read it and then feel free to shake the hand of a combat veteran and offer a special salute to those men who had to step off ramps, unto heavily mined and obstacled beaches and then under merciless fire take heavily armed enemy positions. What men they were. Stephen E. Ambrose devotion to the soldiers of World War II is on the same scale as those soldiers, sailors, and airmen who sacrificed the ultimate sacrifice -their lives. 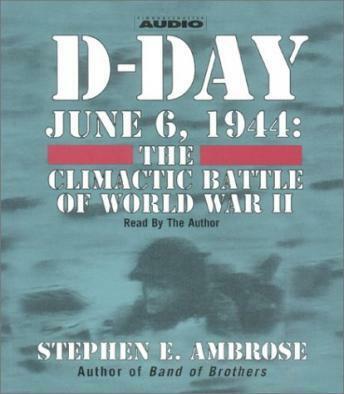 This audio book list the logistical, environmental, command and control issues that took place on both the American and German side prior to D-Day. Ambrose's personal touch of using actual D-Day veterans to describe the horrors of this 20th century battle gives the reader the small insight into the bravery of these men who fought for their country. I highly recommend listening to this audio CD if you have any respect for the brave individuals who fought in any war. It will make you appreciate our veterans even more! Stephen Ambrose is the master of taking the individual stories of the common soldier and then weaving them into the larger story of historical events. While listening to D-Day, I found myself really caring what happened on that fateful day. Furthermore, I developed a much better understanding of the how and why of the invasion of Europe. History is about people, and Ambrose is a great story-teller who is able to bring the people to life in this account of D-Day. When I listened to this book, I found myself wanting to keep driving just so that I could keep listening. I listen to the books as I drive in my car. You can't go wrong with a book by Stephen Ambrose. The book is good - but the author is obviously a better writer than narrator. I found his voice monotonous and uninspiring. Another fabulous historical effort by Ambrose. Along the lines of Band of Brothers and his other books. Well written and very interesting. I wish it were in the unabridged form because I really wanted to hear/learn more.